This statue in fine-grained white marble represents a richly dressed female figure that can be interpreted as an member of the aristocracy or, more likely, a goddess whose identification remains uncertain, as relevant parts of the work are missing. A round hole on the left shoulder, that bears traces of an iron pin, suggests that the figure carried a bulky object in her left hand; this object, held upright, rested on the figure’s shoulder. Should it be a cornucopia, the character could be identified with the goddess Fortuna, or with an empress in the likeness of such a goddess. The solemnity of the figure is given by the sumptuous attire, carved in such a way as to enhance the different texture of the fabrics: subtle and impalpable for the two tunics and heavy for the long cloak (in linen if not wool) that reaches down to her feet. The figure’s garb consists of a tunic with long and close-fitting sleeves upon which a second garment, tightened up by a waist-high girdle just below the breast, is draped. An ample cloak, resting on the left shoulder, turns around the back of the figure, then passes under her right arm and drops on the front in pleated folds that gather on her left arm. Her attire is complemented by closed footwear with high soles. The front view of the figure, that rests her weight on her right leg while the left is gently bent backwards, is enlivened by a slight, almost imperceptible step forward that is barely suggested by the position of her legs. The statue’s style and the extensive chisel work that shapes the folds with an extremely moderate use of the running drill – which results in a little chiaroscuro effect, especially in the thickest folds – seem to indicate a craftsman’s technique still in use in the 1st century AD. The place of discovery of the statue, which was fortuitously found in 1953 in Via della Vite as a sewer gallery was opened, seems to be related with the Temple of the Sun, a large monumental group of buildings erected by emperor Aurelianus between 273 and 274 AD, after the conquest of Palmyra, where the dedication to Sol Invictus evoked the ancient oriental cult of Ba’ al. 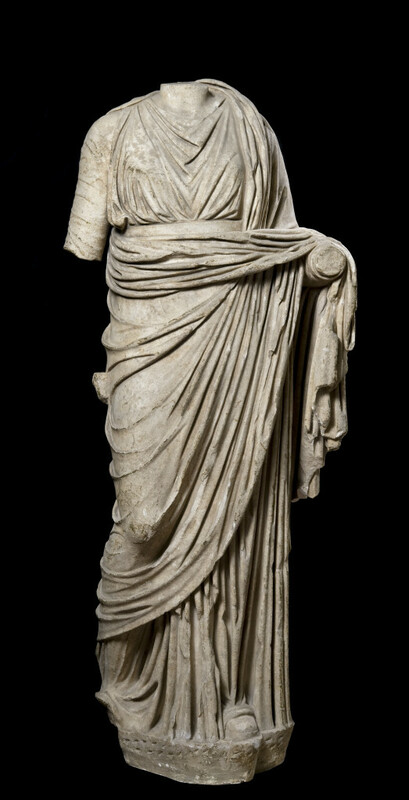 The interpretation of this statue as the goddess Fortune, or as a member of the imperial family or of the aristocracy as Fortuna, is connected with the food supply policy (the Annona) of Aurelianus who, during his short and difficult reign, made plentiful donations of bread, wine, pork and salt to the Roman people. Therefore, the statue may have been reused in this period either keeping its original appearance as a divinity or replacing the head, now unfortunately lost, with a portrait.